Every serious boat owner knows that there is never a bad time to refresh your knowledge or learn some new tips when it comes to boat ownership and regular boat maintenance. If you are a boat owner, or perhaps the perfect boating weather you are seeing has made you interested in owning a boat, and you are looking for some information on general boat maintenance, here is some information to help. If you are new to boating, there is no better place to start than with a general boating course. This will teach you the basics of how to operate a boat, along with general safety tips. Whether you or your passengers expect to be swimming or just sitting on the boat fishing, each person on your boat should know how to swim. Once you have settled on an itinerary, provide copies to friends or family. If you know the particular co-ordinates of a location you will be visiting, be sure to include these. In the event that you do not return at your designated time, this information is extremely helpful to the Coast Guard. Before you head out on the water, make sure that all of your engine fluids are at their suggested levels, and that you are always carrying spares. To get the right fluids for your boat, or to give it a synthetic oil change before you head out, speak with Ace Hi Oil at (888) 459-9958. This is the primary oil that your engine needs to operate and can be the difference between a safe and enjoyable outing, and getting stuck and needing to be towed back to shore. If it has been a while since your last synthetic oil change, before your trip is the best time to do it to ensure your engine can perform at its best. 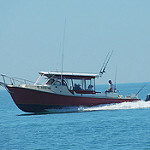 Where your car has power steering to help you turn the wheel, your boat likely has hydraulic steering. Both of these require fluid in order to ensure they work properly, and that you are able to steer yourself out of trouble. Operating at high RPM under the beaming sun can cause your boat's motor to reach extreme temperatures. There is likely a small tank which is easily accessible that is designed to hold engine coolant. Look through your owner's manual and be sure to keep your coolant level topped up to the right level, and more importantly, with the right product. One of the most overlooked aspects of basic boat maintenance are the propellers. Many owners assume that, seems it spins in water, there can't be much damage that occurs. However, the opposite is true. While you may only see water as you drive, small pieces of debris can be floating just under the surface and damage your propellers as you move. Before you take your boat out, give your propellers a quick visual inspection. If you notice any dents, cracks, or loose bearings, tend to it before your trip. These are all crucial items for you to tend to before you leave for a boating trip. However, speak with your Coast Guard or boat supplier before your trip and ask their professional advice. When it comes to your engine, always be sure to use high-quality products and fluids. If you are considering a synthetic oil change before your journey, speak with Ace Hi Oil at (817) 431-6664 and ask which products are best suited to your engine. Something as simple as a quick synthetic oil change can make a big difference in your engine performance, and is a task which you can perform at home.